Welcome to Cessnas 2 Oshkosh 2019! 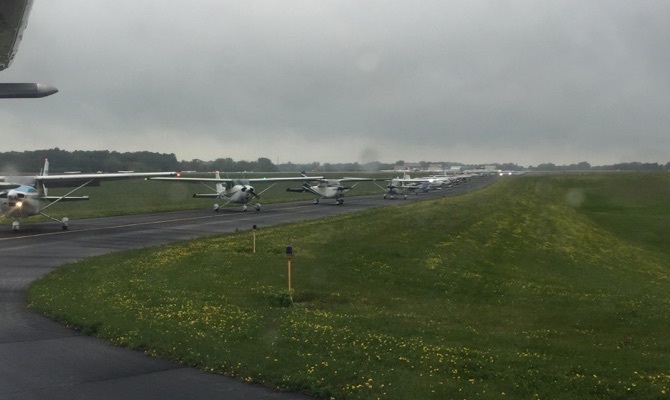 As we salute spring, we welcome all of you to the 14th Annual Cessnas 2 Oshkosh Mass Arrival. We hope you and those who are dear and important to you are all doing well. Craig, Gil, Rodney and the clinic instructors have been hard at work planning this year's training program and the annual migration to AirVenture - Oshkosh. We have made a couple of minor but important changes to the training regimen. Your instructors will highlight those changes during the clinic presentations and training flights and we will fully integrate them into the mass arrival flight mission briefing. We have also made some changes to our registration process to address the concerns of some of our participants and make it more efficient. The main change is the shortening of the registration period, which began February 1 and will continue until June 6. NO LATE REGISTRATION in 2019. Check your calendars and sign up early! These changes are explained on the "To Fly Our 2019 Mass Arrival..." section. We normally use the AmericInn Lodge & Suites Beaver Dam as our hotel while at Juneau. The hotel is in the middle of renovations and we were only able to secure 13 rooms. If you choose to stay there, please mention Cessnas 2 Oshkosh to gain access our block of rooms. Information is available on our FAQ page. As an alternative we will be also staying at the Quality Inn Beaver Dam. We have a block of 35 rooms if you choose to stay there. The hotel has just finished some renovations and Iâ€™m looking forward to seeing their work. Also mention Cessnas 2 Oshkosh to access our block. Information is also available on our FAQ page. Check-In at Juneau will end sharply at 11:00 AM CDT (UTC-5) and the mission briefing will begin promptly at 12:00 PM CDT (UTC-5) on the 20th of July, so please plan your trip accordingly and be on time. We are confident that the 14th Cessnas 2 Oshkosh Mass Arrival will bring us all together, new and returning pilots, our relatives and friends to safely enjoy another great Cessnas 2 Oshkosh Mass Arrival and celebration. We would like to thank all of you who have stepped forward to help out and extend our call to those who have yet to come forward. We need all the help that we can get. Craig, Gil and Rodney thank you for your continued participation in Cessnas 2 Oshkosh and look forward to seeing you in Juneau. ...a pilot must register and pay the registration fee, participate in at least one formation flight training clinic in 2019, be on the ground at Dodge County Airport (KUNU) and checked in by 11:00 AM CDT on Saturday, July 20, 2019. The participating pilot must also attend the mass arrival final preflight brief held in the main hangar of Wisconsin Aviation in Juneau, Wisconsin starting promptly at 12:00 Noon CDT (UTC-5). July 23, 2016 - Second Wave of the 2016 Cessnas 2 Oshkosh Mass Arrival holding for takeoff. - Photo by Gil Velez - Kilo 2. The registration process is simple: starts by clicking on the Registration tab (the first from the right at the top of every page) and answering a few questions about yourself, your passenger(s) and your aircraft. Pilots who have registered to fly the mass arrival in the past, whether they flew the arrival or not, can save some time by retrieving their information from our database. To do so, click on the link on our registration page, log in using the same email address and zip code that you used in the most recent registration, check the prefilled form for errors and make any necessary corrections and changes. Once you are done, submit the updated form. The final step in the registration process is paying the registration fee. The fee covers the cost of the polo shirt embroidered with our logo, the Friday dinner and the Saturday lunch at Juneau, and the BBQ dinner at Cessna Base Camp in Oshkosh. Our registration fee in 2019 remains $65.00. Children up to 12 years of age will not incur a fee. We use Paypal® to process the registration fee payment. You are not required to have a Paypal® account. The process is simple and intuitive. You can pay using your Paypal® account, if you have one, or the major credit card of your preference. For detailed information about the payment process, click here. The absolute deadline to register to fly the Cessnas 2 Oshkosh Mass Arrival is the seventh Thursday before the mass arrival at midnight CDT (UTC-5). In 2019 the deadline is Thursday, June 6, 2019 11:59:59 PM CDT (UTC-5). Nevertheless, you must be fully aware of the requirement to participate in at least one formation training clinic during 2019 to be able to fly the mass arrival. You must register while there is still a suitable clinic in the 2019 schedule to obtain formation flight training and meet this requirement. Registered pilots have until this deadline to withdraw from participation in the mass arrival and obtain a refund of the registration fee. This is also our deadline to place the shirts order with our vendor. Congratulations Cessnas 2 Oshkosh 2018! 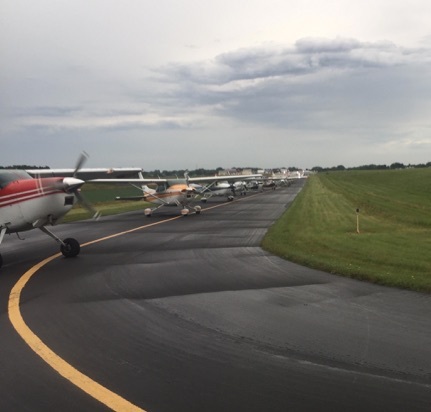 On July 21st, the Saturday before the start of EAA AirVenture 2018, Cessnas 2 Oshkosh conducted its 13th annual mass arrival into the Wittman Regional Airport in Oshkosh, Wisconsin. Congratulations to each and every one of our pilots! We accomplished our mission of flying our eighty-seven (87) planes into Oshkosh in spite of all the challenges. Not only did we accomplished our mission, but we actually set a record for the group: the highest number of aircraft participating in our mass arrival flight. The number of registered aircraft at the end of the registration period: 125, was the largest in our history. 115 aircraft registered in 2008 and 111 in 2010. The number of aircraft that actually flew the 2018 mass arrival: 87, was the largest in our thirteen years history. The total number of Cessnas 2 Oshkosh aircraft on the ramp at Dodge County Airport in Juneau at the start of our preflight brief: 90, was also the highest in our history, and a record for Wisconsin Aviation too. Thanks to all our pilots, relatives and friends for making the 2018 Cessnas 2 Oshkosh Mass Arrival a tremendous success. We are excited to report that eighty-seven (87) aircraft flew the 2018 Cessnas 2 Oshkosh Mass Arrival Flight. Fifteen (15) of the eighty-seven (87) PIC flew the mass arrival for the first time in 2018. Our eighty-seven (87) registered PIC brought with them seventy-three (73) passengers over the age of twelve (12) years and five (5) children under 12 years of age. We warmly welcome the new pilots and their passengers to our group and hope they had the most fun in the celebration at Cessna Base Camp and AirVenture. 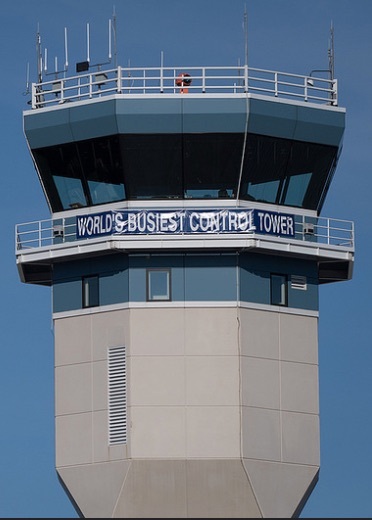 Thirty-eight (38) of the one-hundred-twenty-five (125) pilots who originally registered withdrew their registrations for different personal, family or work-related reasons or couldn't make it to Dodge County Airport in Juneau on time to participate in the flight. Of these thirty-eight (38) pilots, several were able to join us later in Oshkosh and participated in the celebration. We missed the pilots who couldn't make it and hope that they will join us next year. Twenty-eight (28) states, the District of Columbia and two (2) Canadian provinces were represented. Texas led the states with fifteen (15) aircraft, followed by Florida with eight (8) and Washington with six (6) aircraft. Massachusetts and Virginia had four (4) aircraft each. The Cardinal again led the models with thirty-three (33) aircraft, followed by the Skylane with twenty-five (25), the Skyhawk with twelve (12) and the Centurion with eight (8). Of the eighty-seven (87) aircraft, fifty-six (56) had fixed landing gear and thirty-one (31) were equipped with retractable landing gear. Needless to say, we are elated with these results and would like to express our most sincere thanks to all of our pilots, relatives and friends for their support in 2018.